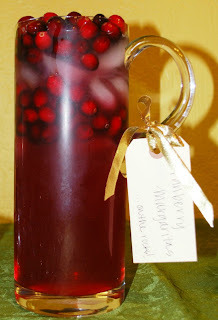 Heather Giustino Blog: Cranberry Margaritas on the Rocks! Cranberry Margaritas on the Rocks! This is a super duper simple recipe I made up for a Christmas party Tony and I threw. I like my drinks strong, and this was strong! If you like your drinks a little weaker, just add more juice. First thing's first. The night before you plan on drinking these rinse your cranberries well. Pour them in a big bowl, and then pour all of your tequila on top. Generously sprinkle sugar on top of the cranberries to break up some of their bitterness. Cover with foil or plastic wrap and leave it in your fridge overnight. Day of the party: Get a pitcher and fill it halfway with your cranberry-infused tequila. Fill the rest of the pitcher with your cranberry juice, add a splash of lime juice and garnish with your tequila-infused cranberries! 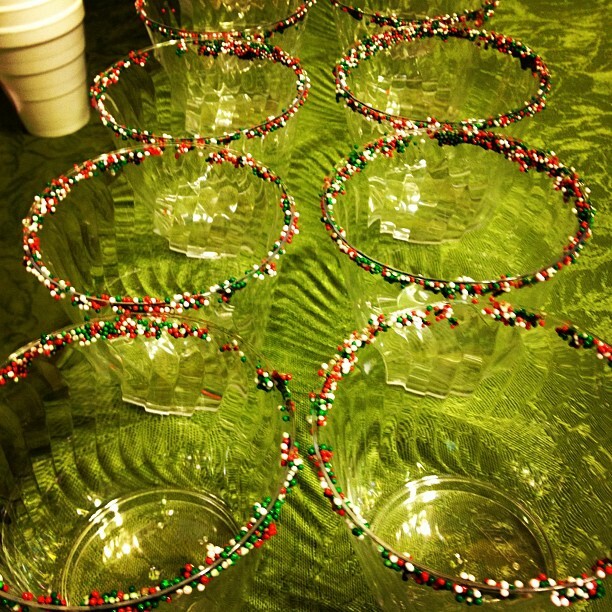 If you want to get festive, line the rims of your drinking glasses with sprinkles. To do that, fill a shallow bowl with lime juice, dunk the rim of the glass in there, and immediately dunk the rim of the glass into your sprinkles. And there you have it - a crazy easy, crazy good drink recipe. Enjoy! Sounds great! Will have to give it a try!